The single species, Calluna vulgaris, is very widely distributed throughout Western Europe including Azores, Iceland and Faeroe Islands, eastwards into Siberia, and southwards into northern Morocco in North Africa; this range represents about 125° longitude west to east and 36° latitude north to south. Calluna is reported reaching about 2,700m altitude in southern Switzerland. Calluna is also a naturalized exotic plant in many other places including North America(See Ref. 1 below), Australia and New Zealand. Ling, Calluna vulgaris, is native in Britain and Ireland. Low-growing, evergreen shrubs requiring acid soil. 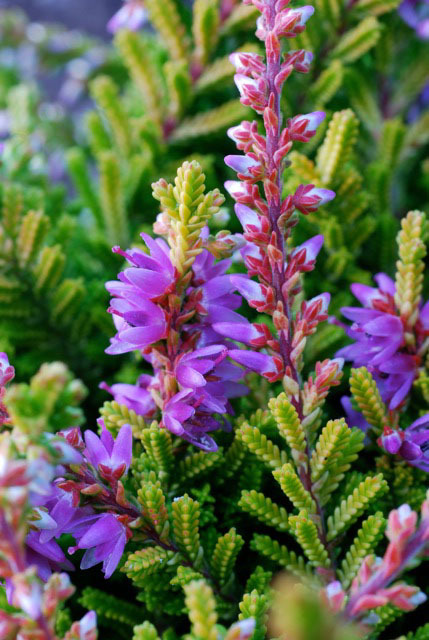 Calluna has minute leaves closely pressed to the shoots and small, usually lavender flowers in summer and early autumn. Suitable for USDA hardiness zone 5 but some cultivars are suitable for zone 4. This species is very variable, and the numerous selected cultivars (cultivated varieties) reflect, indeed exaggerate, this variation. In habit, ling ranges from prostrate, 5 x 45cm (2 x 18in), to erect and spreading 60 x 75cm (24 x 30in). The foliage varies in colour from dark green to bright green, grey, yellow, orange and red, and there are silver-foliaged plants too. The flowering time varies; in the northern part of the distribution it blooms from June to August, whilst in the southern part of the distribution it blooms from August to November. The white to crimson flowers normally possess a cup-like, four-lobed corolla about, 3mm (¹⁄₈in) long, overlapped by four sepals of similar size and colour. Double-flowered and bud-flowering (called ‘bud-bloomers'(See Ref. 2 below)) variants also exist and generally bloom later. Ling is an important garden plant providing colour throughout the year. Calluna was used as the name for this heather 'on account of its very frequent use in the construction of brooms' – it was derived from the ancient Greek καλλύνω, (kallyno), in turn derived from καλός (kalos, beautiful). J. Wiksten, 2000. Heather follies of 1861. Yearbook of The Heather Society 2000: 35–42. E.C. Nelson, 2010. 'The mythical Calluna atlantica': heather in Newfoundland. Heathers 7: 27–35. J. Schröder, 2005. The explosion of bud-flowerers. Heathers 2: 17–18. E. C. Nelson, 2006. Lucky white heather: a sesquicentennial review of a Scottish Victorian conceit. Heathers 3: 38–46. E. C. Nelson, 2009. Victorian royal wedding flowers: orange, myrtle, and the apotheosis of white heather. Garden history 37 (2): 232–237.